(Nanowerk News) Nader Jalili, an associate professor of mechanical and industrial engineering at Northeastern University, is working to create a controlled nanorobot that will be capable of performing non-invasive cancer surgery with a degree of precision not possible through existing surgical procedures. At about the size of a ring box, nanorobots could revolutionize surgical practice within the next five to 10 years by making procedures of all sorts more precise and safer, said Jalili. Associate mechanical and industrial enginnering professor Nader Jalili displays an image of a nanorobot on his office computer. Guided by image-based information, the futuristic mechanical device would rely on a number of motors that move in tiny, exact increments, enabling it to pinpoint the exact location of a tumor or other surgical object. “While a surgeon’s instruments cannot get to within a millimeter of a tumor, we will be able to precisely guide the robot to a location at a sub-nanometer or nanometer resolution, making us able to see things that we could never see before,” Jalili said. A nanometer is .000001 millimeters, and a nanotube is 1/1,000th of the thickness of a human hair. His nanorobots could also be used to take minute skin samples for pathological testing as well as for diagnostic purposes, or to inject medicine or other fluids very precisely into a patient’s body in order to destroy a tumor. Jalili is currently designing motion algorithms and preparing to test his nanorobots for different tasks. Nanorobots are made up of sensors and actuators derived from special nanomaterials, such as synthetic zinc oxide, quartz and gold, which have unique features in the nanoscale. Applying mechanical force to these nanomaterials produces electrical energy, turning some into sensors that track motion, movement and direction, and others into actuators that convert electrical energy into mechanical motion, to move parts such as a nanorobot’s gripper. 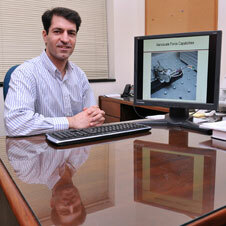 Effective nanorobots would not put surgeons out of work, said Jalili. Rather, they would take on supervisory roles in the operating room. He likened the role of a surgeon who works with a nanorobot to that of a pilot who puts his plane on cruise control. Jalili’s research has been backed by a five-year, $400,000 National Science Foundation (NSF) CAREER Award. He also won a $350,000 NSF instrumentation grant to purchase a laser-based micro-system analyzer to view and measure nano-objects—and other materials—in the nanoscale.